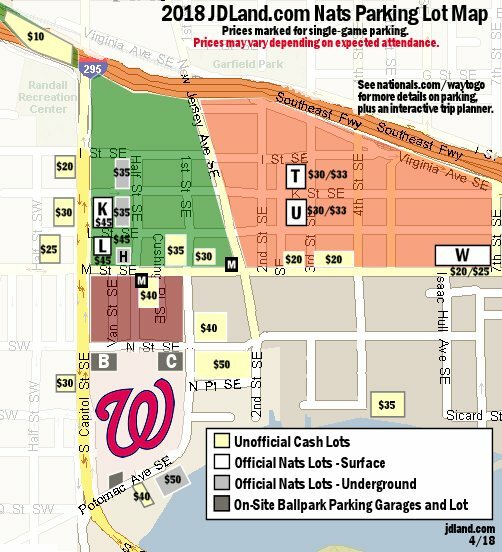 This map shows anticipated lots and basic prices for the 2018 season at Nationals Park, based on JD's reporting and on the parking information nationals.com. The Nationals also offer single-game parking, which can be purchased in advance. These lots should also be available as "cash lots," depending on expected attendance. As the 2018 season opens, the large surface lot at Half and I has disappeared from the inventory, but there is an underground option that arrived last year at Half and K (entrance at the rear of the building). And thanks to the start of work on the new Douglass bridge, the two lots on South Capitol south of Potomac nestled next to the current bridge have disappeared as well. For driving directions, see the official Nationals web site. See also this guide from DDOT about traffic, parking meters, biking, rideshare and taxi access, and more. In its Opening Day guide for 2018, DDOT says that it is "Ballpark Performance Parking meter rates on days with Nationals Park events. The rates will be in effect for the entire day for all days with stadium events. The rates will be $2.30 for the first hour and $8 per hour for each subsequent hour. There will be no restrictions on parking durations." Streets near the ballpark that don't have meters will likely have specific signs exluding parking on game days, or are zoned for Zone 6 resident parking only. "After the game, a Taxi staging area will be designated on the west curb of Cushing Place between L Street and M Street to facilitate taxi flow into the M Street taxi stand. Nationals fans are reminded to pay attention to the wayfinding signs to locate the taxi stands. [...} DDOT has collaborated with Transportation Network Companies, along with the Department of For Hire Vehicles (DFHV) to prevent pick-ups and drop-offs on South Capitol Street between the SE/SW freeway and the Frederick Douglass Memorial Bridge; M Street between 5th Street SE and Delaware Avenue SW; as well as any street closed to all traffic. Rideshare passengers are encouraged to consult TNC apps for more information." According to the Nationals' Way to Go section on biking, there are more than 250 bike racks around the ballpark, and also a free bike valet, located in Red Garage C at the corner of N & 1st Street, SE. Access to the valet is on N Street just left of the entrance. The valet accepts bikes two hours before game time and will close 1 hour after the last inning. A large Capital Bikeshare station is available at 1st and N, directly across from the bike valet. There are also stations at 1st and K, 3rd and Tingey, and New Jersey and M. See the web site for more information on how the bikesharing program works.